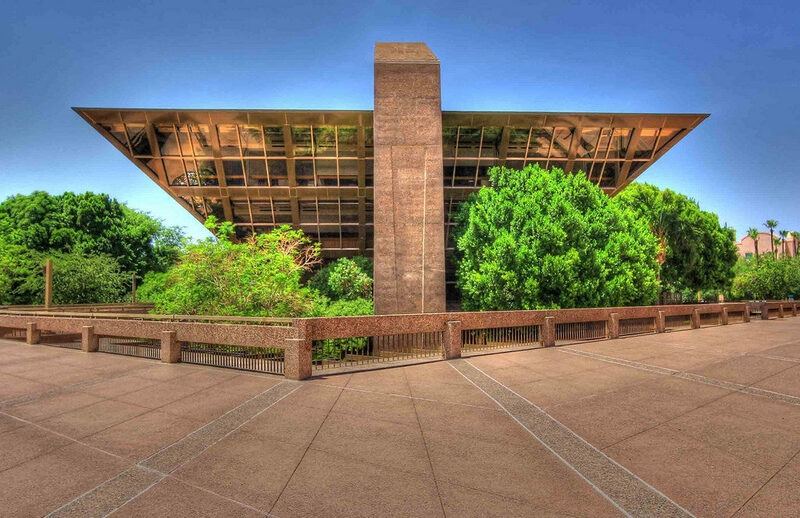 The City of Tempe Municipal Building (aka City Hall) located at 31 East Fifth St. in Tempe AZ, is yet another striking example of the Masonic dominance over the Salt River Valley. Not only is it obviously an inverted pyramid, but it embodies such an enormous amount of Masonic symbolism and numerology as to dispel any doubt that the entire site is an energetic machine of sorts. 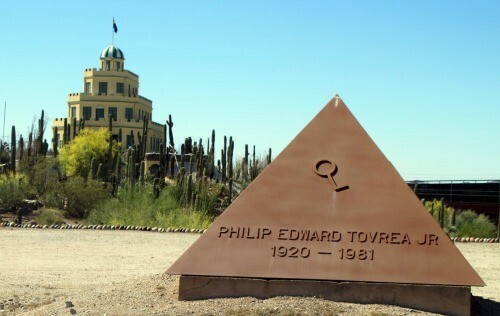 Standing head and shoulders above all other Masonic buildings in the Valley of the Sun, this structure was designed and built in multiple dimensions; by this I mean it was built embodying many layers of knowledge and code on many different levels. 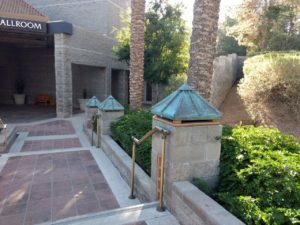 The City of Tempe Municipal Building is the brainchild of Michael Goodwin and Kemper Goodwin, of Michael & Kemper Goodwin Ltd architecture firm. 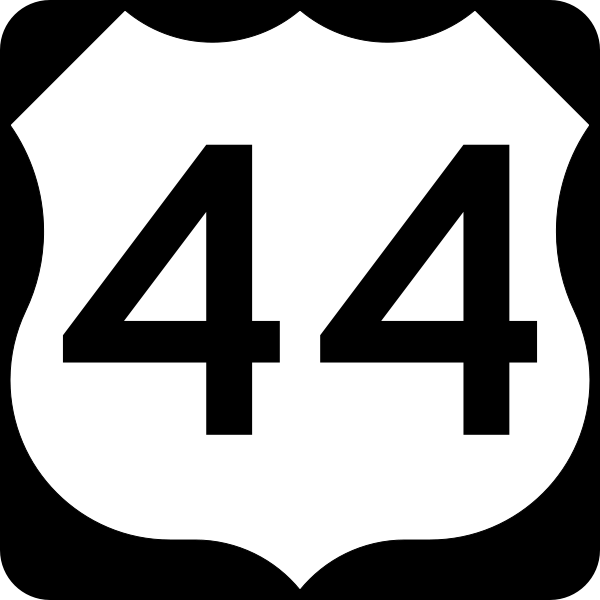 It was constructed between 1969-1971 and Inaugurated on Oct 2nd, 1971. The Structural Engineer was Hanlyn, Mann, and Anderson; and the contractor was M.M Sundt Construction Company of Phoenix, AZ. When viewed from the above – north being up – the entire site is laid out in the exact likeness of a Masonic altar. The round-a-bouts in the street just south of the complex especially stand out as they are obviously meant to represent Boaz and Jachin (the two pillars) originally in King Solomon’s Temple. They have been incorporated rather effectively into the entire design subtly tying the complex into the greater community as a whole. The numerology encoded into this structure is that of the number 9, and it is off the charts. I have gone into it in great lengths in my research here. 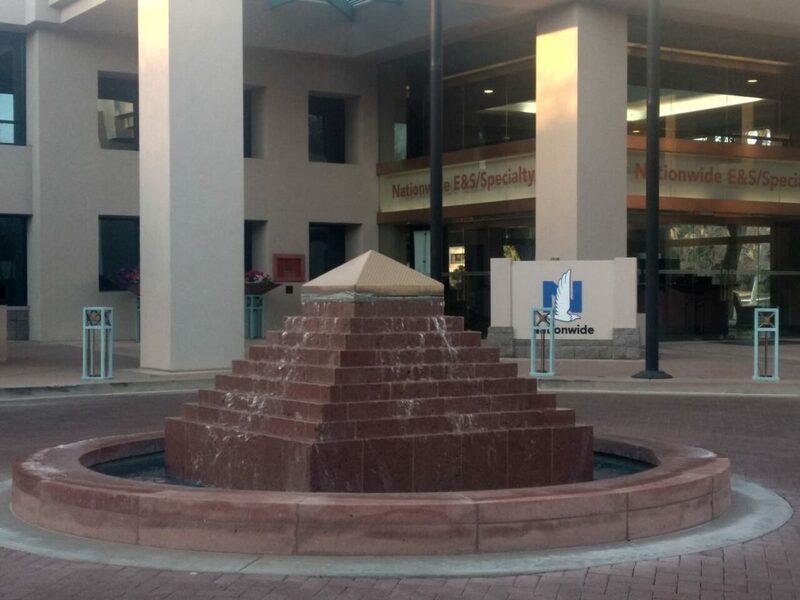 Listed in 2011 at the top of the Phoenix Business Journal’s “Scottsdale-area office Buildings” list, this complex screams Institutional Masonic infrastructure. 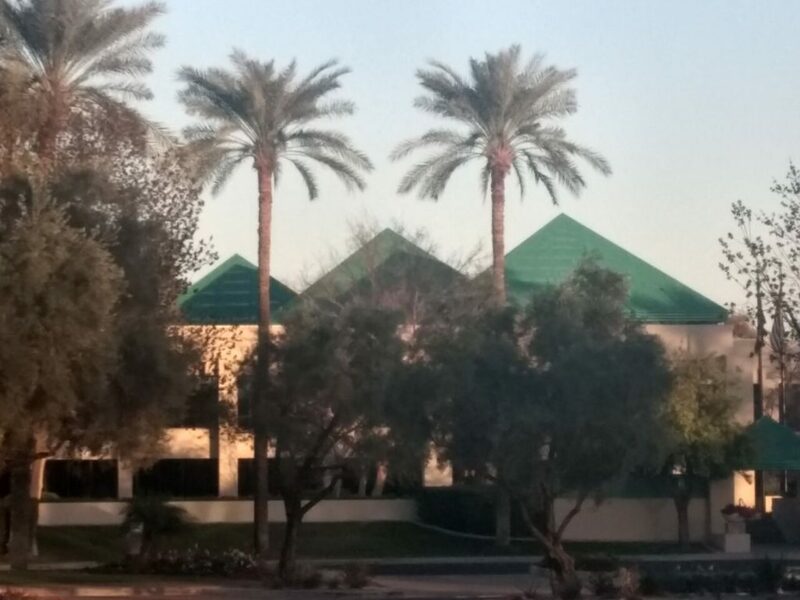 Located 8700-8800 N Gainey Center Dr. in Scottsdale, AZ it is impossible to ignore the huge green pyramids jutting up from the office buildings as one drives along Via de Ventura Rd. It is a matter of record that the majority of the founders of Phoenix, AZ, and the west for that matter were Freemasons. It also stands to reason that the Masons recognized the value and potential of the unclaimed resources of the American West in a time when it was free for the taking. That the Freemasons engaged in a collective and strategic action in the last century to claim the resources of the west for future control and management stands without question. That they still maintain control of these resources and ergo their allocation is also without question. It is no secret that Freemasons have always been in positions of law, government and financing, as well as hard resources such as mineral, lumber, oil etc. It is within these institutions and industries that the course of western civilization is determined and it is within these systems that change is given birth to. It is for this reason that any corporate center with Masonic overtones stands out and it is, for this reason, the rest of the world needs to begin to take notice and understand that their elected leaders, Judges, community corporations, and financial institutions have agendas of their own which don’t necessarily mesh with those of the rest of us. Sure, if we all benefit from it along the way that is well and good, but make no mistake, the goals of Freemasons and the secret oaths taken by its members come first in their eyes. Nationwide Private Client – White Glove service for affluent individuals with distinct property and casualty insurance needs. Meagher & Geer, P.L.L.P. – Minnesota based law firm and the country’s leading litigation defense and insurance coverage firm, representing over 125 insurance companies worldwide. The Noblitt Group, PLLC – Technology attorney law firm, providing technical expertise and legal skills for intellectual property portfolios. All their attorneys are scientists or engineers. Each and every one of these companies have something to do with either Insurance, wealth management, property, Tech, Banking, the internet, or law. I don’t need to tell you that these are the cornerstones of Freemasonry. Do the people who work in these firms know they are operating within a Masonic matrix? I wouldn’t imagine so. Most people are vaguely aware of what is going on around them to a large degree in the first place and even more oblivious if it doesn’t directly affect them. THE INSTITUTIONS ARE MASONIC. It is the ship gliding across the ocean which delivers product, ideas, and change. The sailors simply man the ship. 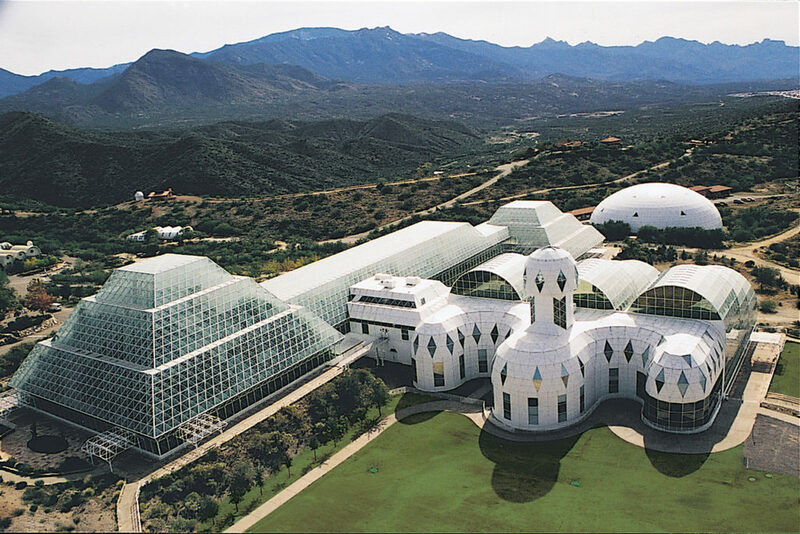 Biosphere 2 is an Earth system science research facility currently owned by the University of Arizona. Originally built to be an artificial, materially closed ecological system, or “vivarium” it 3.14-acre structure sits on 40 acres in the high Arizona desert. Originally, the project was meant to demonstrate the viability of closed ecological systems in order to support human life in outer space. It included 7 model ecosystems, living quarters to accommodate 8 scientists, an agricultural area and a workspace in which to study the interactions between humans, farming, technology, and the respective biomes. Nonetheless, it’s a pyramid. A pyramid which houses an enterprise wherein the stated mission is congruent with that of the stated purpose of the Freemasons. “Making Good Men Better.” And there is no doubt in my mind, the design is arbitrary. As with everything Masonic, knowledge, and intent are conveyed in the kinetic process of their action. What may be going on here? I think I may have an inkling. When the first Europeans came to the new world, it wasn’t the cobblers and bakers, nor was it the farriers or blacksmiths. It was men of noble blood, men of standing and title. I was men who were affiliated with clergy and the existing power structure of the day. Sure, there were soldiers and sailors, but what were their names? Who has written books about them? Where are the institutions of their legacy? And so it is today. When our species finally achieves off-world stability, it won’t be the salesman, baristas, and small business owners. It’ll be the alchemists and sorcerers from MIT and Texas Instruments. Those bending the laws of physics and our current reality. And just like in the days of old, their talent will be harnessed and guided by the same echelon who have been in control of the human species from the beginning. the Landscapes Evolution Observatory (LEO) project. A project which monitors millions of pounds of abiotic volcanic rock to track how this nonliving soil slowly develops over several years into a rich soil which is able to support microbial and vascular plant life. The Lunar Greenhouse, which seeks to understand how to grow vegetables on Mars by developing a bio-regenerative life support system which recycles and purifies water through plant transpiration. A vertical farming project to be built in collaboration with the private company Civic Farm. The stated goal of which is aimed at increasing water efficiency, producing zero farm runoff, with no pests or pesticides and zero effect from external weather conditions. If all this sounds far-fetched. If you are a recovering sports fanatic or a regular consumer of mainstream news. If you are new to the “conspiracy train” and are just now learning about the symbols hidden in your government and the ancient rites performed as a matter of ceremony in plain sight by your leaders and entertainers, this may come as a bit unbelievable at first. For a better understanding of the inseparable links between NASA and Freemasonry, one need only perform a cursory search on the subject. Enjoy.